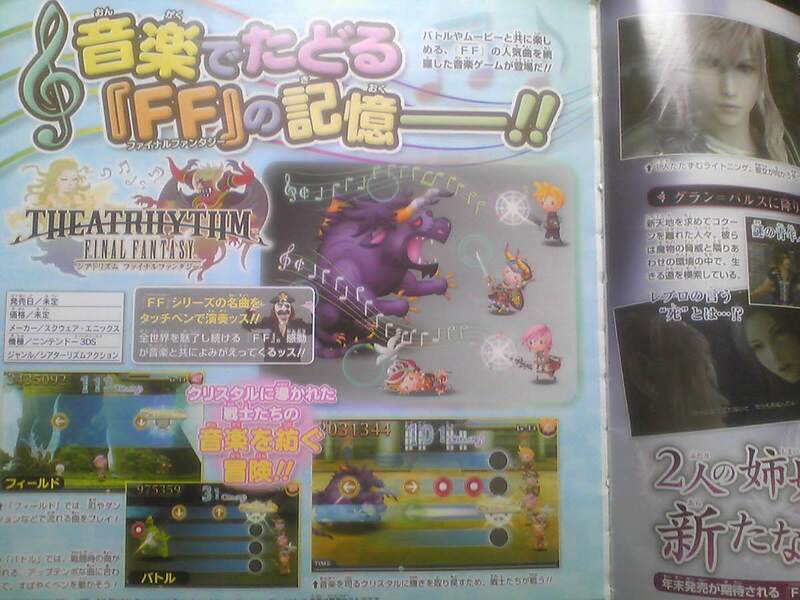 Yep a scan has come up of a Final Fantasy game for the 3DS, it will be a rythm based FF game. Don't know about story but it seems to be something less serious and more funny. I may pick it up if the reviews are good, from what I've seen it has a mixture of characters including some KH's characters (Roxas, Sora). I'm not trying to be rude but why? Square Enix!! why?? Yeah it's a bit annoying that the first FF game for 3DS isn't a traditional Final Fantasy. Not a big fan of the art style myself although if they are sprited hopefully that means no VA's. Although apparantly the team working on this worked on The World Ends with you if thats anything to go by. So, we're looking at a Guitar Hero type thing? On a handheld device? With FF characters? I'd like to play, but I've disliked the DS and the 3DS since the concept came up. ?? idk anything about it, but who at that company thought that was a great idea for investing their time in? ?